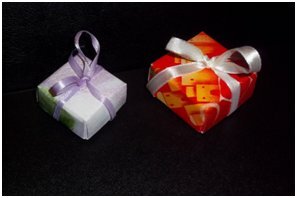 You can wrap ribbon around your box and add a loop of ribbon for hanging. Start with an old Christmas card – cut card in half by cutting along the folded edge of the card. Using ruler measure and cut front of card into a perfect square (mine is 5 inches on all sides), this will be the top of your box. Measure and cut back of card into a perfect square that is ¼ of an inch shorter on all sides than the first square (mine is 4 and ¾ inches on all sides), this will be the bottom of your box. Take your top (first square) and place it picture side down and mark the plain non-picture side by placing a ruler diagonally and make a light pencil line from corner to corner --- do the same with the other two corners ending with two lines crossing in the middle forming a large x. Fold one corner in so that the tip of the square just touches the center mark (where the pencil lines cross). Press and smooth down the fold, then fold this edge in again so that it touches the center (where pencil lines cross). Press and smooth down the fold. Then unfold the square flat again. Repeat the double fold operation on each of the other three remaining corners. Unfold the square flat again and you should end up with a diagonal grid of folds. 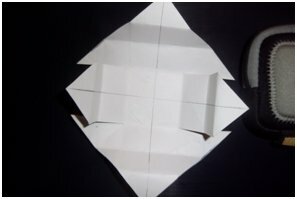 Cut carefully along the fold nearest the center, stopping at the corner of the unfolded square in the middle (where the pencil lines cross). Make three more matching cuts in - ending up with two pairs of parallel cuts as shown in photo. Fold one of the sides in the corner into the middle and the edge folded up at a right angle. Then the opposite side the same. Next fold in the two short pointed ends over the top of the pointed tabs – the corners will lock into place with each other when you push them in place, securing them. Repeat all of the above steps with the smaller square and it should fit perfectly together. All that’s left to do is put the top on the bottom and there’s your small box.